“Who is John Galt?” For those of you who have never attempted the not-so-modest-feat of reading conservative icon Ayn Rand’s mammoth philosophical novel, Atlas Shrugged, or read it decades back in college as some sort of political science requirement towards course completion, you know the answer to that question. But for the general public, whose only knowledge of Ayn Rand’s personal philosophy, “Objectivism” (in essence the idea that men and women should be entirely free of governmental interference in their commercial and daily pursuits so as each to reach his or her maximum personal potential) is the distilled and diluted version of the brand served up by Fox News and right wing advocates such as Paul Ryan, it’s doubtful if viewers lacking the backdrop of the novel will understand who the hell John Galt is. 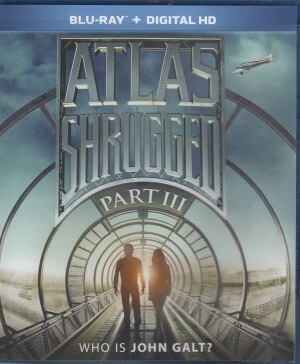 Here’s my take on this film (as an entirety and Part III in particular): Ayn Rand deserves better. The final installment of this sacred tome of the Right is the worst of the lot in terms of editing, story, message, and pace. It is essentially a series of excerpted speeches, with little to no action, from the last third of the novel, making for dull cinema and duller philosophy. It’s also confusing that we are now on actor and actress number three for the two seminal roles of the film, John Galt (here, Chris Polaha) and Dagny Taggart (Laura Regan), the previous two incarnations of those characters no longer viable either due to monetary constraints or artistic differences, which makes trying to watch all three portions of this story in one sitting schizophrenic at best. That having been said, both Polaha and Regan are fine in their parts. Not exceptional but fine. There are a few recognizable faces, including character actor Joaquim de Almeida (portraying copper magnet Francisco d’Anconia) but most of the actors and actresses filling the various key roles in Rand’s story are unrecognizable by viewers; a collection of third and fourth tier performers who are, by and large, utterly forgettable in their roles. But back to my main premise. The book is held by many on the Right to be a Bible (though of course Rand was an atheist who despised religion of all stripes making Atlas a curious reference for the Evangelical Christians now commanding the GOP) of human political, sociological, and philosophical aspirations: the triumph of individual talent and will over the collective power of society. There’s little question that the backers of this effort sought to have an influence on the past three national elections by the timing of the releases of Parts I, II, and III. Though Part I came out too late to influence the 2010 campaign season; Part II was released in 2012 in advance of the Presidential election. Part III was issued in limited release in 2014, just ahead of the congressional elections that returned the GOP to power. With such high minded influence as its goal, one would have thought that the backers of this mess of a franchise would have sought top-notch talent in the acting, directing, and scriptwriting departments so as to ensure gracing Rand’s time-honored prose with the movie she so clearly deserves. But the Koch Brothers apparently weren’t on board and their wallets did not fund this effort. Too bad. Love Rand’s message or hate it, she deserved a movie equal in power to her words. 2 stars out of 5. If you want to watch a movie that replicates the intricacies of Rand’s ideas and also entertains, pick up a DVD copy of The Fountainhead strarring Gary Cooper. You can read my review of that film, along with Atlas Shrugged Parts I and II, in the archives section of this blog under the “Reviews” tab on the website dashboard above.